To Cite: Hosseini S E, Ebrahimipour H, Badiee S, Haghighi H, Mahmoudian P, et al. Performance Evaluation of Mashhad University of Medical Sciences’ Hospitals During 2006-2011: Application of Pabon Lasso Model, Jentashapir J Health Res. 2016 ; 7(4):e78743. doi: 10.17795/jjhr-33517. Background: Performance evaluation is a process, which deals with the evaluation, measurement and judgment of performances over a certain period of time. Objectives: The aim of this study was to evaluate the performance of Mashhad University of Medical Sciences’ hospitals using the Pabon Lasso model. Methods: In this descriptive cross-sectional study, ten educational hospitals of Mashhad University of Medical Sciences (MUMS) were investigated. Data included the following indicators: bed turnover rate (BTR), bed occupancy rate (BOR) and average length of stay (ALS). The data-gathering tool was standardized by the deputy of curative services of the ministry of health and medical education (MOHME). Data was collected from the information technology and statistics management department of MUMS databank, entered into the Excel software, validated, and implemented to depict the Pabon Lasso graphic chart. The position of the hospitals was recognized and analyzed in terms of the above indexes. Conclusions: According to the results, only 30% of Mashhad’s medical centers (Hashemi-Nejad, Anbiya and doctor Sheikh hospitals) were in the third quadrant. In addition, the study findings showed the performance of each hospital according to the Pabon Lasso model. This information can be used to gain the awareness of hospital administrators about their hospital’s situation and position compared to other hospitals, to maintain and upgrade their performance. Performance measurement is essential to manage health care organizations, for which efficiency is per se a vital indicator (1). Measuring and evaluating performance is one of the most important concerns of the health system in any country, especially in developing countries (2, 3). Measuring performance is important to assess the effects of continuous efforts to improve quality of care and ensuring the pursuit of excellence in hospitals (4) and is crucial for both professionals and clients (5). Hospitals provide similar services with different quality (6). It is well-known that hospital quality is highly variable, yet remains difficult to measure (7). Various models for evaluation of the performance of health care organizations have been introduced; each with their own special features (8). Studies have pointed different indexes for evaluating the performance of the hospitals. The most important and practical indexes are bed occupancy rate (BOR), bed turnover rate (BTR) and average length of stay (ALOS) (8). The management of hospital beds is an important subtask (9). Beds are also one of the most important resources in the hospitals and managing beds efficiently is considered as a remarkable indicator of the overall efficiency (10). National statistics show that about 40% of governmental health expenses are related to hospital care in Iran (11). Due to the fact that these beds have allocated huge capitals, from the limited resources of the hospitals, to themselves, it would is vital to take into the account their suitable utilization and effectiveness (12). Quadrant 1: hospitals with low BOR and BTR, which have excessive number of beds according to the existing demands. These hospitals don’t possess the required efficiency. Quadrant 2: hospitals with low BOR but high BTR. Patients who are admitted to these hospitals are of two kinds: patients who need short-term hospitalization like patients in gynecological hospitals and those who are hospitalized for no reason while they could have been treated as outpatients. Quadrant 3: these hospitals have high BOR and BTR and are also of good efficiency. Quadrant 4: hospitals of this type have low BTR but high BOR. These hospitals serve patients with serious chronic diseases or those whose average length of stay is high with no reason. Psychiatric and geriatric centers usually fall in this group (14) (Figure 1). According to the available data, the most suitable BOR was 85 to 90% in most hospitals, while the remaining 10-15% included beds, which are being repaired, changed or being prepared for new patients (15). Hospitals and health systems provide services that vary in quality (16). The largest single source of health care costs relates to hospitals, which account for almost 40% of all health care expenditures (17). The provision of hospital resources, such as beds, operating sections and nurses, is a matter of considerable public and political concern and has been the subject of widespread debate (18). Due to the necessity of continuous and updated evaluations in the health care system, especially in centers providing treatment services (hospitals) (17), we used the Pabon Lasso model to determine the position of hospitals of Mashhad University of Medical Sciences (MUMS) during years 2006 to 2011. In this descriptive, cross-sectional study, all of the MUMS educational hospitals (ten hospitals including: four public, five specialty and subspecialty and one psychiatric hospital) were evaluated during years 2006 to 2011 (Table 1). Three hospitals, a psychiatric hospital and two others, were excluded from the study due to incomplete data during the study period. Data included BTR (number of times patients use a bed and number of discharges (including death) in a certain period of time divided by the number of average active beds at that period of time) (19), turnover rate indicating bed efficiency (20), BOR (number of occupied beds, which is represented as a ratio of day bed to active day bed in a certain period of time) and ALOS (average hospitalization length of patients discharged in a certain period of time) (19). Data were extracted from the information technology and statistics management department of MUMS. Collected data were inspected by two authors for their completeness and reasonableness, and for the elimination of erroneous values, followed by validation. The data were then exported to the Excel software. Depicting the Pabon Lasso graphic chart, position of hospitals was determined and analyzed regarding the above indicators. Researchers declared that in the preparation and presentation of the results of the study, the intellectual property rights of the Mashhad University of Medical Sciences, and the confidentiality of the gathered data were completely observed and the results were presented without any data manipulation. During 2006-2011, the highest BOR rate belonged to Khatam-al-Anbia Hospital (87.35%) in 2011 and the lowest rate belonged to Shariati Hospital (33.67%) in 2009. The highest and the lowest BTRs belonged to Khatam-al-Anbia Hospital (280.19) in 2009 and Ebn-E-Sina Hospital (5.93) in 2006. The highest and the lowest ALOSs were calculated for Ebn-E-Sina Hospital (51.16) in 2006 and Khatamol Anbiya Hospital (0.89) in 2007. Doctor Sheikh Hospital had moved variably between quadrants two and three; during 2006 to 2009, Hashemi Nejad Hospital had a good performance and had been in quadrant three, while it was moved to quadrant one in 2011, which reflects its reduced BOR and BTR. Status of Shariati Hospital and Omolbanin Hospital remained constant in these six years and they were positioned in quadrants one and two. Finally, Khatam-al-Anbia Hospital was moved from quadrant two to three during these six years, which shows it’s increased BOR (Table 2 and Figure 2). The present study aimed to evaluate the performance of MUMS’ hospitals using the Pabon Lasso Model. Generally, about 20% of hospitals (Imam Reza and Shariati Hospitals) were in quadrant 1, which shows that these hospitals had weak performance. The results of other studies performed in Isfahan (8), Ahvaz (17), Lorestan (21) and Yasouj (14) cities of Iran, showed that 10, 7.6, 28.57 and 50% of hospitals were located in this quadrant, respectively. The results of a study in Malawi, 2012, (22) which evaluated 40 hospitals in 2005 and 2006, indicated that 19% of the hospitals were located in the first quadrant. However, in a study carried out by Nekoei-Moghadam et al. on Kerman and Shiraz hospitals (23), none of the hospitals were placed in quadrant one. Hospitals are located in this quadrant due to lack of efficiency, lack of induced enthusiasm in staff, and lack of optimized use of hospital beds based on the type of referred patients and quality of services. These hospitals can improve their performance by improving the admission of the patients, and boosting their staff enthusiasm, especially the physicians. Furthermore these hospitals have excessive beds compared to their demands; therefore by increasing the quality of their services, they will be able to increase the number of patients. Quadrant 2 is for hospitals that have high BTR due to their special services (short-time hospitalization centers like gynecological hospitals). Therefore, if a center with the mentioned conditions is located in this quadrant, it shows effective performance; otherwise, it has unnecessary hospitalized cases or excessive beds. Thus, these hospitals have relative efficiency, and managers need to pursue efficiency improvement measures (23). In this study, Omolbanin Hospital had always been positioned in quadrant 2; considering its specialty (gynecological hospital with short-term hospitalization), it can be concluded that it had acceptable performance. Similarly, Doctor Sheikh Hospital in 2006 and 2008 and Khatam-al-Anbia Hospital in 2006 and 2007 were in this quadrant, and considering their specialties (pediatric and ophthalmology), their high turnover is justified. The results of other studies carried out in Isfahan (8), Ahvaz (17), Lorestan (21), Shiraz and Kerman (23) showed that 39, 27, 21.42, 25% of hospitals are located in this quadrant, respectively. On the contrary none of the Yasouj (14) hospitals were located in this zone.In 2005 and 2006, 5% of Malawi hospitals (22) were also located in this quadrant.Hospitals in zone 2 can improve their performance through using their active beds repeatedly, and using subspecialty equipment and staff. This study showed that only 30% of MUMS hospitals (Hashemi Nejad, Khatamol Anbiya and Doctor Sheikh) were in quadrant 3. Hospitals in this quadrant had good performance, achieved suitable efficiency with minimum usable beds and had desirable efficiency in managing their affairs. However, being in this quadrant isn’t sufficient to gain higher efficiency because improving efficiency in managing affairs is a trend for which no ultimate limit can be imagined. Therefore, improving the performance, maintaining the status of the centers in the third quadrant and moving the position of hospitals to the northeast point of the graph, must be considered by hospitals’/health care centers’ managers.Since only a few hospitals from those studied in this research were in quadrant three, most hospitals did not have efficient and reasonable performance. The results of other studies carried out in Isfahan (8), Ahvaz (17), Lorestan (21), Shiraz and Kerman (23), and Yasouj (14) showed that 45, 38, 35.71, 50, 33.3% of hospitals were positioned in this quadrant, respectively.Eleven percent of Malawi hospitals (22), specialty and grade three hospitals, were located in this quadrant. In this research, 40% of centers (Ghaem, Omid, Ebn-E-Sina and Kamyab) were in quadrant four; other study results carried out in Isfahan (8), Ahvaz (17), Lorestan (21), Shiraz and Kerman (23), and Yasouj (14) showed that 6, 27, 14.28, 25, 16% of hospitals were located in this quadrant, respectively. Centers in quadrant four have high BTR, low BOR, low utilization of facilities and high expenses (common in psychological and geriatric medicine). Although these hospitals work relatively well, they have low proportion of usable beds and long hospitalization period, which can be only found in psychological hospitals. However, improving performance in these hospitals and thus changing their position (moving towards northeast) is very possible and must be taken into account by managers and authorities (23), for example the number of unnecessary and long term hospitalizations can be reduced. Unfortunately, our results revealed that only one out of four hospitals located in this quadrant during the period of the study was a psychiatric hospital, which reflects the low performance of other hospitals located in this quadrant. 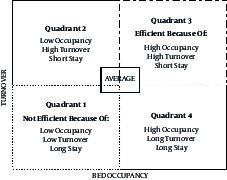 Hospitals of the first quadrant (Imam Reza, Hasheminezhad and Shariati) and those in the second quadrant of the graph (Ghaem & Kamyab), can increase the turnover of their beds by faster response to the patients, decreasing the waiting time for their release from the hospital, optimum utilization of the operation rooms and improving the connection of the hospital’s sectors with the diagnostic sectors. Furthermore, decreasing the ALS, especially for patients of the public sector, which have long queues, assists the increase in the rate of bed occupancy, while moving the beds from sectors with less occupancy to more crowded sectors can be regarded as an effective measurement. Using the three indicators of Pabon lasso including bed occupancy rate, bed turnover rate and average length of stay, can prevent the formation of confusion in evaluation, and allows rapid assessment of the overall performance of hospitals. Considering the three criteria of the Pabon lasso graph, simultaneously, the current status of hospitals in terms of efficiency and performance can be determined. The studied hospitals can employ the following strategies for improving their performance: improving the performance indicators and attempting to extend their services like providing obstetric, pediatric and internal medicine care. Furthermore, hospitals have to absorb more patients so that their empty beds become occupied immediately. To increase patients, hospitals have to improve the quality of their services. Unnecessary and long-term hospitalization must be reduced. Active beds must be implemented in hospital’s wards and be used frequently. Recovery, emergency, and healthy newborns beds must be calculated possibly in the census of the hospital beds. Hospitals have to provide subspecialty equipment and experts. The admission and administration system of hospitals must be regular and active for the easy access of the patients. The main technical limitations of the studies carried out using Pabon Lasso model is that the effect of some factors (access to communication facilities, lack of access to home or community care, geographical position, status of educational hospitals, number of hospital’ staff and hospital policies) on indexes of hospital performance cannot be measured by this simple tool. The authors wish to thank Mr. Ghavami, Head of the statistics department of Mashhad University of Medical Sciences. Funding/Support: This research was the result of an approved study by the research deputy of Mashhad University of Medical Sciences (Code: 911126). 1. Mehrtak M, Yusefzadeh H, Jaafaripooyan E. Pabon Lasso and Data Envelopment Analysis: a complementary approach to hospital performance measurement. Glob J Health Sci. 2014;6(4):107-16. doi: 10.5539/gjhs.v6n4p107. [PubMed: 24999147]. 2. Jahanmehr N, Rashidian A, Khosravi A, Farzadfar F, Shariati M, Majdzadeh R, et al. A conceptual framework for evaluation of public health and primary care system performance in iran. Glob J Health Sci. 2015;7(4):341-57. doi: 10.5539/gjhs.v7n4p341. [PubMed: 25946937]. 3. Gholipour K, Delgoshai B, Masudi-Asl I, Hajinabi K, Iezadi S. Comparing performance of Tabriz obstetrics and gynaecology hospitals managed as autonomous and budgetary units using Pabon Lasso method. Australas Med J. 2013;6(12):701-7. doi: 10.4066/AMJ.2013.1903. [PubMed: 24391682]. 4. Kone Pefoyo AJ, Wodchis WP. Organizational performance impacting patient satisfaction in Ontario hospitals: a multilevel analysis. BMC Res Notes. 2013;6:509. doi: 10.1186/1756-0500-6-509. [PubMed: 24304888]. 5. Moret L, Anthoine E, Paille C, Tricaud-Vialle S, Gerbaud L, Giraud-Roufast A, et al. Relationship between inpatient satisfaction and nurse absenteeism: an exploratory study using WHO-PATH performance indicators in France. BMC Res Notes. 2012;5:83. doi: 10.1186/1756-0500-5-83. [PubMed: 22293709]. 6. Zarei A, Arab M, Froushani AR, Rashidian A, Ghazi Tabatabaei SM. Service quality of private hospitals: the Iranian patients' perspective. BMC Health Serv Res. 2012;12:31. doi: 10.1186/1472-6963-12-31. [PubMed: 22299830]. 7. Heijink R, Koolman X, Pieter D, van der Veen A, Jarman B, Westert G. Measuring and explaining mortality in Dutch hospitals; the hospital standardized mortality rate between 2003 and 2005. BMC Health Serv Res. 2008;8:73. doi: 10.1186/1472-6963-8-73. [PubMed: 18384695]. 8. Hadi M, Sajadi HS, Sajadi ZS. Is there any method to compare key indicators of hospital performance simultaneity? Director General. 2011;8(1). 9. Schmidt R, Geisler S, Spreckelsen C. Decision support for hospital bed management using adaptable individual length of stay estimations and shared resources. BMC Med Inform Decis Mak. 2013;13(1):1. 10. Zhu Z. Impact of different discharge patterns on bed occupancy rate and bed waiting time: a simulation approach. J Med Eng Technol. 2011;35(6-7):338-43. doi: 10.3109/03091902.2011.595528. [PubMed: 21916602]. 11. Lotfi F, Kalhor R, Bastani P, Shaarbafchi Zadeh N, Eslamian M, Dehghani MR, et al. Various indicators for the assessment of hospitals' performance status: differences and similarities. Iran Red Crescent Med J. 2014;16(4):12950. doi: 10.5812/ircmj.12950. [PubMed: 24910796]. 12. Rafiei M, Ayatollahi SMT, Behboodian J. 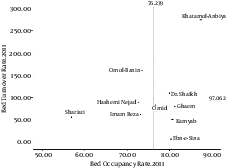 Bed occupancy rate modeling in Shiraz hospitals. J Qazvin Univ. 2008;12(2):56-62. 13. Pabon Lasso H. Evaluating hospital performance through simultaneous application of several indicators. Bull Pan Am Health Organ. 1986;20(4):341-57. [PubMed: 3828621]. 14. Goshtasebi A, Vahdaninia M, Gorgipour R, Samanpour A, Maftoon F, Farzadi F. Assessing hospital performance by the pabon lasso model. Iran J Public Health. 2009;38(2):110-24. 15. Mohammadkarim B, Jamil S, Pejman H, Seyyed MH, Mostafa N. Combining multiple indicators to assess hospital performance in Iran using the Pabon Lasso Model. Australas Med J. 2011;4(4):175-9. doi: 10.4066/AMJ.2011.620. [PubMed: 23393508]. 16. Woodard TD. Addressing variation in hospital quality: is Six Sigma the answer? J Healthc Manag. 2005;50(4):226-36. [PubMed: 16130806]. 17. Zahiri M, Keliddar I. Performance evaluating in hospitals affiliated in ahwaz university of medical sciences based on pabon lasso model. J Hospital. 2012;11(3):37-44. 18. Harper PR. A framework for operational modelling of hospital resources. Health Care Manag Sci. 2002;5(3):165-73. [PubMed: 12363044]. 19. Sadaghiyani E. Hospital organization and management. Tehran: Jahan Rayane; 2011. 20. Dutta S, Biswas R, Lahiri A. A study on bed utilization in the gynaecological ward of a district hospital in West Bengal. Indian J Public Health. 2005;49(4):263-4. [PubMed: 16479918]. 21. Kavosi Z, Goodarzi S, Almasiankia A. Performance evaluation in hospitals of lorestan university of medical sciences using pabon-lasso model. J Payavard salamat. 2013;6(5):365-75. 22. Asbu EZ, Walker O, Kirigia JM, Zawaira F, Magombo F, Zimpita P. Assessing the efficiency of hospitals in malawi: An application of the pabon lasso technique. African Health Monitor. 2011;14(1):28-33. 23. Nekoei-Moghadam M, Rooholamini A, Feizabadi VY, Hooshyar P. Comparing performance of selected teaching hospitals in kerman and shiraz universities of medical sciences, iran, using pabon-lasso chart. J Health dev. 2012;1(1):11-21.